As part of my Journeyman training with the Lettering Arts Trust I have been out into London today to study work by other lettering artists. I got off the train in Waterloo and headed by foot towards Chelsea. Coming over Westminster bridge I could see the scaffolding on Big Ben and the Houses of Parliament and thought of all the stone masons working on the renovations. I was very tempted to go into Westminster Abbey and see the huge collection of stone inscriptions and memorials. But I had just one day and plenty more on my agenda so I wouldn’t of been able to do it justice. Especially as it costs £18 to get in. I will go soon and will make a day of it. Westminster Cathedral however, was also in my route, and being free to visit I could resist calling in. I had seen before Eric Gill’s ‘Stations of the Cross’ from 1914 but I wanted to see them again now I have more understanding of letter form and their history. The letter shapes are strongly based on the Trajan Roman alphabet. They look strong and elegant. I found the relief carving to be simple and beautifully done. There is also other interesting work in there including an inscription by Robyn Golden-Hann. My main aim for the day was to visit the Physic Garden in Chelsea where the Lettering Arts Trust has an exhibition called ‘Elixir of Letters’. The theme the artists had to work to was ‘Drink’ and the pieces were inspired by and incorporating the interesting plants from around the garden into their design. It is really interesting to see how different artists interpret the theme in different ways. Tea seemed a popular topic and there were some quotes and lines from poetry. I asked myself how I would have approached it and also for individual pieces, would I have used that style of lettering or that sort of stone. I personally feel that the limestone and sandstones fit in and look better in a garden like that than the slate. Although perhaps fitting in isn’t always the aim, maybe standing out is sometimes intended. There was lots of information around the garden and you could have guided tours to learn all about the medicinal and other uses of the plants. I got myself caught up these tours a couple of times and realised the importance of learning more about the gardens and their contents, if I’d been intending to exhibit a piece. I then went to the V&A with the hope of seeing the Trajan column, on which the modern alphabet is based on. This was wrapped up for restoration so couldn’t be seen, I sort of expected that but I still held out hope for a glance of it… I was disappointed. But I did see lots of other interesting treasures. Including some more lettering, done in the style from the Roman times but this was actually done in the 14th century. It shows how the influence of the Trajan column and other Roman works influenced letter cutters all through the centuries. I will go back in 2019 to see that Trajan column. Overall it was a fascinating and inspiring day out. Besides the examples I have discussed London is full of stone inscriptions, above doorways and plaques on walls. Relief carvings seem to be everywhere. Even just walking through the streets I think I would come home inspired. But I am totally buzzing after everything I have seen today! The Oxford University Press is updating it’s children’s dictionary, as it does regularly. Words no longer used get replaced with new or more relevant words. This time however, it has come to peoples attention that many nature related words of things that many grown-ups associate with a big part of their childhood, are going to be removed. There are 30 words to be cut, these include words such as Bluebell and Magpie and Conker and Willow. A Beautiful book has been written by Robert McFarlane and illustrated by Jackie Morris to commemorate these words. The Lettering Arts Trust has come up with the idea to get these words carved in stone so they are there forever and not going to be lost. I was slightly alarmed when I first saw the list of words that were being removed from the list. To me these words are childhood, how could there be a childrens dictionary without these words? Surely there would be very little left in it. Without these words how could I ever tell anyone about my early life experiences. How could I teach my own children about the joys and riches of the countryside. Is it enough for them to know that this is a flower, or this is a bird? Or is it important to know what type of flower or bird. It may not be essential to know these things in life but it is certainly a very important part of developing a passion for and relationships with the natural world. I know things change over time and over generations and that many children spend a lot more time indoors or doing organized activities than they used to. But with the increasing environmental threats and dangers of global warming it is essential for the future generations to have an interest and passion for the natural world. I realise that these words are not being obliterated from the English language, just from the childrens dictionary. But childhood is when people have the time and mindset to absorb all the wonders of the world and to develop the knowledge and understanding of whats around them. I have chosen the word Dandelion to carve in stone. It is a very strong plant which can come back persistently year after year whatever is done to it. It is also a very delicate, plant with seed heads that come off with one breath and can float for miles on the wind. It has beautiful, bright yellow flowers that enhance the colour of everyones summer. I have been spending the last few weeks thinking how I am going to carve the word and if and how i am going to illustrate it. I have come up with many ideas and done many sketches and today I have been deciding which one I like the best and is most do able in stone. Getting it just how I want it is proving a challenge and knowing which design best represents such an amazing plant. I remember blowing dandelion clocks into the air to tell the time on a warm summers day and being down by the stream catch newts in a net or sitting silently to try to catch a glimpse of the kingfisher. We would make dens under the willow tree and climb some of the big old trees pulling ivy off as we went. As the autumn came we would be covered in scratches from the brambles, as we’d feast ourselves on the blackberries. We would collect conkers to put on shoelaces to see whose was the best. We’d pile up acorns to give the squirrels a helping hand. If we were lucky we would get some chesnuts and hazelnuts to take home for the family. After many weeks (on and off) of designing my italic alphabet, drawing it, rubbing it out and drawing it again….. and again, I have eventually began to start carving it. 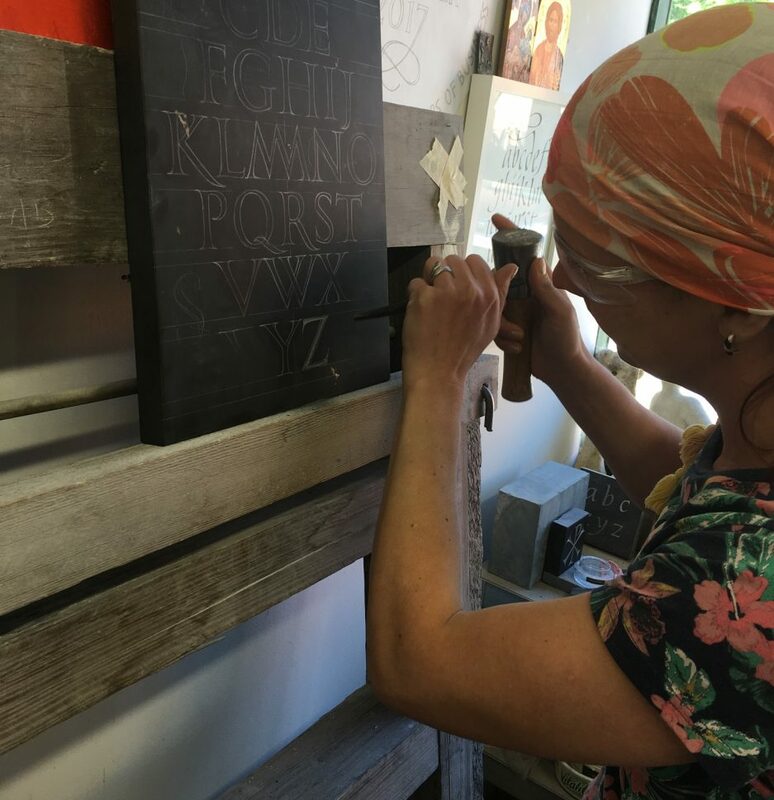 I started it of raring to go and feeling confident …but I quickly realised I was rushing it and that is not the best approach for producing beautifully carved letters. Robyn could notice straight away that I seemed stressed. I was huffing and puffing and my letters, although not awful, did not have the grace and elegance they needed. The following day we had a good talk about how to approach the carving. The first point and most general and possibly most important was to relax. We have agreed to start each day with 5 minutes of quiet meditation to relax and focus. We have done this 2 times now and I can really feel the difference. It feels better than rushing into the workshop and picking up a chisel. Throughout the day too I need to take my time and breathe and relax. The second point, regarding my approach to carving, is to ‘carve like a ballerina’. I thought this was a funny idea when I first heard it but it is starting to make sense. If you want that grace and elegance in your work it has to come from the way you carve it. I have been carving in quite a heavy handed way, like the mason that I am. But I need to change my approach for these fine delicate italic letters. I have began to ‘ Let the chisel do the work’. This also seemed like a funny idea, like the elves and the shoemaker…. I thought it meant that if I leave it overnight and the helpful chisel will carve it, while I’m sleeping. It’s not quite as easy as that, but what does seem to work when I just hold the chisel lightly and follow where the chisel naturally wants to go. I give it the guidance but I don’t force it to do anything. Since these few simple alterations to my approach the letters I have carved have become vastly more graceful and delicat. I have still done some I am not so happy with but I can see that it happens when I get tired or lose concentration. This week has definitely been an upward step in my letter carving skills. I feel as though I have made a breakthrough in my skills that I hope I build on next week. Onwards and upwards! This week I have spent some time with one of our stone suppliers. I wanted to do this to gain experience of the larger scale less personal approaches to making memorial stones. Robyn has a very personal approach to her clients. Every stone is vastly different and reflects the deceased person as best as possible, by Robyn interpreting the information gained from the client in lengthy discussions. Clients will often become emotional and open up to Robyn. These are people who strongly value the personal touch and appreciate the design and craftsmanship and time that has been put into a piece. Many other memorial masons however, provide handsome stone memorials but without the personal interpretation of the clients information by an artist. The client can choose their design from a catalogue, and choose additions such as relief carving for it. They can choose their font and the type of stone and if the lettering is gilded. There is a list of text that can be written, though the client can bring their own text. Basically, within the wide variety of options the client can have what they want, and on request have more too. I had a great time and experience at Phoenix Granite and Marble. I spent some time in the office with the man who organises the layout of the designs on the computer. They use about 10 fonts regularly, and encourage those ones as they work well on stone. He can change the individual spacing of the letters in a word and stretch them etc. He changes the spacing when he can see the spaces look wrong. He will input the information from the client and make it look right before printing it out to the size needed for the headstone. It is printed on vinyl with a sticky back. The vinyl is then taken downstairs and the mason will take the back off and stick it onto the stone and then blast the stone with a fine jet of sand to wear away the surface. This is the basic process but it is usually not quite as straight forward as that. The stone will have been got ready, sawn to the right size and shaped. and finished to a fine polish. There may have been some carving work or design on the stone. The granite stones tend to be shaped and finished now in China and any work on them other than the lettering will be done there. The first one I observed was Portland stone and the sand was blasted by 80psi with not the smallest gauge nozzle. Then I was shown what can really be done with a sand blasting. One of the very experienced masons showed me how to carve a multi-layered rose. Using a very fine nozzle and a psi of 30-40 he could make soft curved edges and undercutting and textured leaves etc. The outcome was great and I didn’t know that that sort of detail could be done by a sand blaster or in a commercial environment. I was very impressed. Over the summer I travelled through Germany and took a some time to study the stones in a German cemetery. I found there some beautiful, big irregular stones. The lettering was very different to what we would find in a British cemetery or church yard. Many of the stones had small metal letters stuck on. Other stones had sort of ‘snakes’ of lead lettering stuck into a indentation. The emphasis seemed to be on the beauty of the stone and not the lettering itself. There was some v-cut lettering, though proportionally very little. There was no sign of the Roman alphabet. This could be because Germany was not occupied in the same way by the Romans and so doesn’t have the same historical Roman influences that we we do in Great Britain. The summer lead me to take a good break away from the workshop. Now back in the studio I have renewed energy and excited to be getting back into my learning journey. I got straight back on the stone, it’s seems the break may have done me some goodand I felt more relaxed and sure about what I was doing. I have been working on a small simple memorial stone in Welsh Slate for a Friar who recently passed away from Hillfield Priory. The design was done by myself before he summer based on existing memorials at the Friary. After carving it I rubbed it over, dry with this amazing 400grit stone polishing block. It gets off all the pencil marks and gives it a nice polish. I have spent a lot of time this week drawing italic letters. I’ve done a few different designs for carving an italic alphabet. There is no standard benchmark for italic letters, but I am working in a studio full of wonderful examples. These are the italics I will use as my benchmark. Even within Robyn’s work, it is interesting how the italic lettering changes, depending on the composition on a piece and the style and design. Italics can be close together and you can fit a lot more italic letters into a space than you would Roman. Some examples are closer together than others. Some have beautiful flourishes growing from them. The weighting can be different on them and the shapes of the bowls of the letters. The stems and tails can vary greatly. This is an old piece of Robyn’s that I am using as a reference.